The last Monday in May has become the traditional start of summer, and all that summer means. The lengthening days, the flowers beginning to bloom, and the close of the school year remind us that the time is coming to renew our gardens, tune the lawn mower, and get the lawn furniture out of the garage. The last Monday in May has a deeper, more significant meaning. It is the day that we designate as Memorial Day, perhaps the most sacred holiday of our secular nation. The traditions that became Memorial Day originated in the mountains of the rural American South. Even before the Civil War, families would gather in the late spring for Decoration Day. It was a time to clean the graves of the recently departed as well as those of distant ancestors. The designated day became an extended family reunion. Some would travel hundreds of miles for the occasion where connections with kinfolk would be renewed, and the living would enjoy "dinner on the ground", a potluck dinner on sheets and table cloths spread on the ground. During the Civil War, it was often necessary for soldiers to be buried far from their native homes. At first Freedmen, former slaves, assumed the duty of tending the graves of these fallen heroes, and in time, whole communities became involved. Celebrations included parades, barbecues, and concerts. Members of the Grand Army of the Republic, an organization of Civil War Veterans, along with others began calling for a national Decoration Day. Supporters selected May 30th because the date was not the anniversary of a Civil War Battle. The name Memorial Day for the national Day of Remembrance became popular after WWII. The Uniform Holidays Bill of 1968 placed the celebration on the last Monday in May. As sacred as the day is, there is no getting around the fact that it is the unofficial beginning of summer. Even if the ground is still a little muddy, we hope that the smell of freshly mown lawn will mix with the smoke from the barbecue to remind you of parades and celebrations past and present. We also hope that you will enjoy the shows in our Memorial Day Collection while you are driving to your family get-togethers or while you are waiting for the charcoal in the barbecue to be ready. 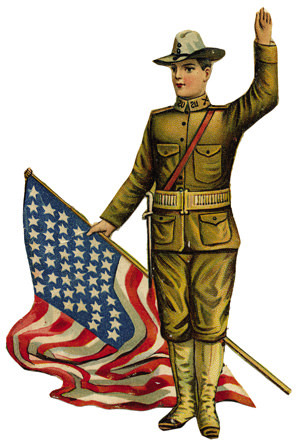 The Memorial Day Old Time Radio Collection including many Memorial Day themed radio shows honoring those who gone before us. Included in this collection are radio shows from the history genre such as Cavalcade of America, Anthology, and Against the Storm. There is also an episode of The Great Gildersleeve with the family getting ready for the Memorial Day Parade. This Memorial Day, we hope you join us in remembrance of fallen American service men and women who gave their lives for our freedom. I served in the Navy from 1968 to 1975 as a Hospital Corpsman. Thanks for the recordings. At 72 I hate these damm computers, but I love the recorindings on old radio cat. Hope you and your wonderful company have a fun and relaxing holiday. Will be ordering again as soon. Just wanted to let you know that I'm still here and always enjoy checking out your latest offers. The thing is my OTR library is quite large and so I can afford to be a little "picky" on which titles to add. I like to say that a day without listening to the "golden age of radio" -- is like well a day without sunshine! Hope OTR cat is doing well.